Lula Belle's is a gorgeous 6 room bed and breakfast with a top notch restaurant located in the heart of downtown Hannibal Missouri overlooking the Mississippi River. 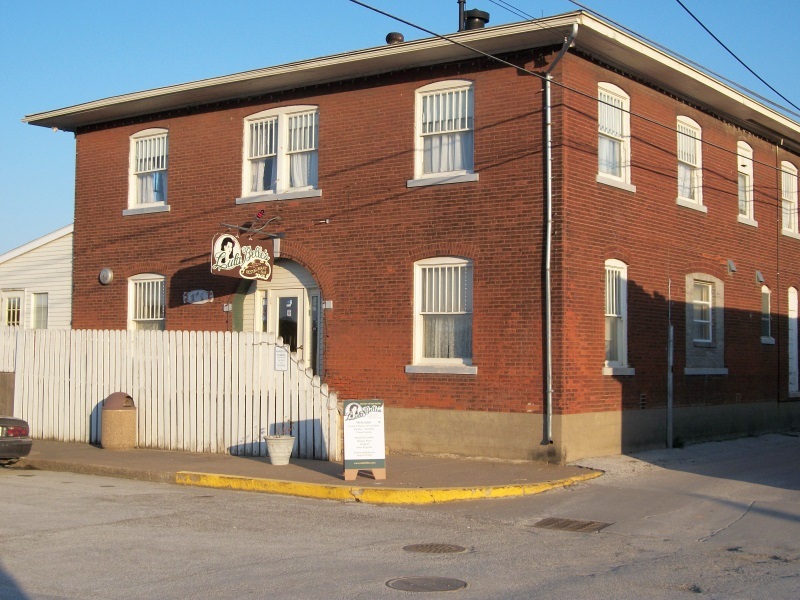 The building was built in 1917 and was immediately used by the owner as a brothel. Even after his death in the 1930's the premises were maintained by the next owner until the 1950's when the local clergy finally managed to get it closed down. Although it was perhaps not the only institution of this nature located in downtown Hannibal, it was certainly one of the most famous and fabulous. Based on our previous investigations of the locations, we decided to arrive on a Thursday, hoping that it would not be too crowded during a weekday, and booked the "Farmer's Daughter" room, an amazingly beautiful two-room suite with a Jacuzzi. It turned out to be a great decision. The only section we were unable to investigate was the Angel of Delight room. That still gave us access to the remaining 5 rooms for the entire evening. After we arrived at about 4pm we settled into our room which had a breathtaking view of the Mississippi River. As we were unpacking our gear, we quickly realized we had left behind our most important pieces of equipment, our digital audio recorders! Fortunately Trish had her trusty GPS, and being seasoned travelers, were able to locate a nearby Walmart where we could purchase a replacement. Our investigation began around 7pm in our room and, although the bedroom area was quiet, the living room of the suite was another story! To start, the K2 meter shot to red while placed on the couch. When we moved it across the room and placed it on a table it continued to spike. I kept thinking it had to be high EMF coming from some of the electrical sources in the room although I was unable to isolate any specific device. These readings continued on and off for 20 minutes and then suddenly stopped. I was shocked having never been able to determine that the meter activity was caused by any identifiable phenomena. The next room we investigated turned out to one of the most interesting, The Gypsy Rose room. Trish and I were commenting about how much we liked the room, how cozy it was and even how we would not mind renting this room the next time we come back. It was quiet for about 10 minutes and all of a sudden we started getting spikes again on the K2 meter. Unlike the ones in our room, these actually seemed to respond to our conversation about whether ghosts eat or not. (I still say No?) Once the meter had quieted down, we went on to the remaining rooms where we garnered little activity. Before returning to the Farmer's Daughter Room for the night we decided to make one last stop in each room. I sat with the meter and recorder for 3-4 minutes asking questions and then we left the recorder in solitude for 5-10 minutes. We got a couple of interesting recordings from this session. The only personal experience I had was while leaving a room across the hall; I swear I heard a female voice. Throughout the evening we thought we heard footsteps in the hallway or stairwell with no one there. The final incident I must relate took place in the sitting room of our suite during one of our snack breaks. I had the meter sitting quietly on the couch, and decided to move it across the room to the table that had given off readings earlier. 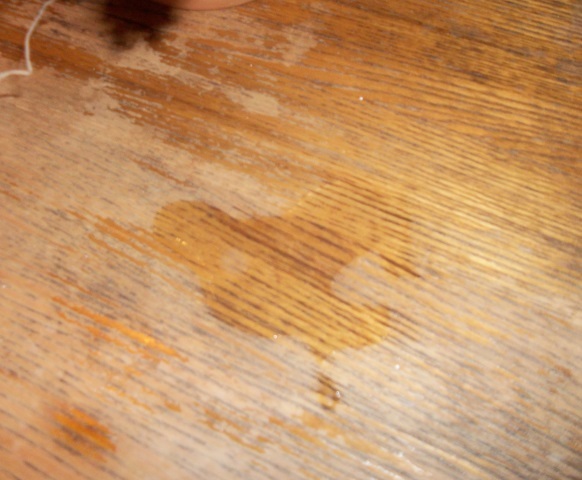 We were astounded to find an actual puddle of water on the table in the exact spot of my earlier readings. There were no apparent leaks or spots in the ceiling. We had not had any drinks so couldn't have come from condensation. After taking a photo we wiped it up, but a couple hours later another puddle had formed on the opposite side of the table. Again we found no explanation to how it could have happened. During the evidence review we easily found corroboration that the K2 meter in the Gypsy Rose Room may not have been caused by natural phenomenon. Each time the K2 meter went off; we captured some solid EVPs, perhaps some of them a bit disturbing. What is ironic is the fact these creepy EVPs came from the room that we felt was so comfortable. I guess that confirms my take that we are perhaps not the most sensitive investigators on our team. We certainly intend on returning to Lula Belle's in the near future, perhaps with some of our more "Sensitive" CAPS members. We would also recommend this quaint little B & B whether you have an interest in the paranormal or not. It is comfortable, well located, and reasonably priced. If you like a little extra excitement, it may be the place. Oh yes, it was a great breakfast too!!! Farmer's Daughter Room: sounds like a child's voice at around 5 sec after we wished her happy birthday... "Vicki"
Gypsy Rose Room: a male voice around 3 sec joining the conversion... "Back off"
Farmer's Daughter Room: whispery voice around 2 sec... "I don't know"
Farmer's Daughter Room: Sounds like we had company, perhaps a female with an accent? "Hurry"
Farmer's Daughter Room: We are responding to K2 hit, around 5 sec a voice quickly says, "I see it"
Gypsy Rose Room: Meter going off and around 2 sec... "Not"
Jaded Jewel Room: at around 7 sec there's a scream right before I say "Oh my God" because the meter is going crazy. Jaded Jewel Room: sounds almost like two voices at around 9 sec, not sure but maybe "Orange-yellow"?